After last year’s ridiculous postseason run by the Wizards, this was supposed to be the year the Washington Wizards grew up and took it to another level. After all, this was a franchise that drafted three top five picks in four years. That was not meant to be. Despite finishing 46-36 during the regular season, Washington was thankful they are in the most disgraceful conference in American Sports. If they were in the Western Conference, who know’s how they would have even survived against even a Kevin Durant-less Oklahoma City or Utah. Now it did not start out as poorly as it turned out to be. The Wizards were 22-8 coming after December 29th and were playing their most beautiful basketball of the season. John Wall was becoming John Stockton 2.0 before our very eyes. Bradley Beal was finally becoming the Ray Allen-style knock down three point shooter and 35-year old Rasual Butler kept on eating those lucky charms as he became an NBA Jam man-on-fire coming off the bench. Before the New Year, they had to travel west and face their toughest competition all year at the time. They didn’t come back to DC well and the league began to figure them out. They found out the Wizards were too slow considering the number of over-30 year old veterans were on this team. They found out that a bench lead by an exponentially aging Andre Miller couldn’t get it done anymore. Most importantly, Randy Whitman couldn’t get it done. The only game I went to this year was the Cleveland game back in February. That night, LeBron James and Kyrie Irving torched the Wizards and it was a 30-point blowout before you could say “Jamie Foxx sat next to a delusional Ted Leonsis”. You know it’s bad when Matthew Dellavedova and James Jones’ rocking chair are making jumpers all over your team. You know it’s bad when your city cares too much about getting a free chicken sandwich from a homophobic fast food restaurant than the result of the game. And you know it’s bad when the metrorail gonna metrorail. In the year 2015, you must do three things and ONLY three things well in order to be a successful offense at any level, let alone the NBA. Drive to the lane and make lay-ups, drive to the lane and draw fouls or make three-point shots. For some reason, head coach Randy Whitman never understood that and nor does he want to. Instead, he always believs in “taking what the defense gives you”. That’s all well and good in some cases, but that philosophy could result in allowing you to take the most inefficient shots in basketball: long two pointers. The Wizards were among the league leaders in attempts from that area and were the worst in three-point attempts. They also fell in the bottom ten in free throw attempts and it’s all thanks to staying in the forbidden areas and not being able to create contact while getting to the cup. That’s why replacing Miller with Ramon Sessions made sense, because Sessions has been able to perform that task for the majority of his career. But that all being said, Sessions has always been a wild player, trying to get to the basket and finding life more difficult than others to make two points. He, along with others were flawed players. Either for their age or their lack of certain skills or their ability to find their pure potential. It takes smart coaches to teach their players to do the right things and Randy Whitman has proven to not be one of those guys. His worst sin is to not be able to trust 21-year old Otto Porter during the regular season and playing a small-ball lineup with Paul Pierce at power forward and either Marcin Gortat or the eternally broken down Nene at center because those two can never have a good game at the same time. In short, you don’t come to a college dance party with vinyl records when mP3 players, smart phones and laptops are the proverbial weapons of choice. And then, the Toronto series happen. They started to ACTUALLY PLAY small ball. They started shooting threes. They finally looked like a 21st century basketball team. While losing to the Raptors in all three games during the regular season, something clicked in Washington’s attitude and playing style by game two and “the North” was never the same ever again. Despite being careless with the basketball and “Whitman ball” rearing it’s ugly head in the third quarter of game three, the offense flowed beautifully to withstand DeMar DeRozan’s 20-point assault in the first quarter. 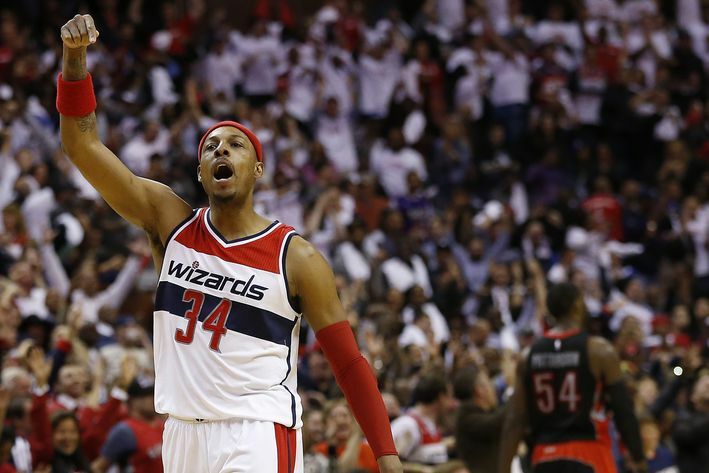 And then Paul Pierce happened: telling all of DC why he is here and having Steve Buckhantz bring out his trademark call. And then Sunday happened. Passes were flying the likes of which only the Harlem Globetrotters could master. Three pointers were attempted and made as if the entire team deserved to be in the shooting contest on All-Star Saturday. Literally, moneyballs were going in. The execution was done. Toronto looked hopeless and broken as they have the same problems as any of the non-top three teams in the east. They were a flawed team that couldn’t afford to have any niggles or poor performances to their star players. Surely enough, that’s what happened to Kyle Lowry as he was constantly getting into foul trouble and couldn’t make field goals at the rate his Raptors teammates would like. There will be tougher opponents to come. Everyone’s favorite story, the Atlanta Hawks, could come next for the Wizards and if things break right, Lebron James and his Cleveland Cavaliers could be coming for the Conference Finals. I don’t like to speculate because only DC can find a way to have their sports teams have such a perfectly good setup in the playoffs and screw it all up entirely. Just look at the Indiana series last year. They pretty much brought back Roy Hibbert’s confidence back from the stoneage, let alone the dead, because they went back to “Whitman ball” and John Wall shied away from contact like nobody’s business while attacking the lane. That can’t happen anymore, especially if this team ever wants to no longer be the worst professional sports team in Washington, DC the last forty years. More importantly, it can’t happen if this city ever wants to see a conference finals or a championship in their lifetime ever again. Being a sports fan is the worst.